Of course the private sector has benefited immensely from the fight against terrorism! This did not start with the 9/11 attacks in New York but that heinous act did put a huge amount of money into the (global) fight against terrorism. Metal detectors, new weapons, bullets and transport, new security infrastructure construction, radiation detectors, emergency preparedness gear, hiring of thousands of new security related personnel and bureaucrats, cyber security software and services, body scanners and on and on. We point out this small anecdote from the United Kingdom as an example of how underplayed the role of and benefits to the private sector have been, from this unending war on terrorism. 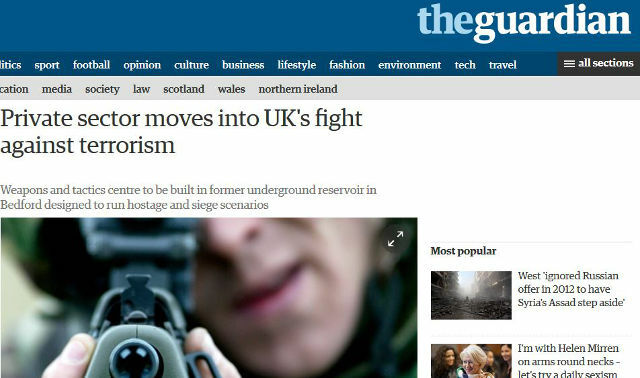 The private sector is moving into the fight against terrorism as British police and the military are to be offered the chance to hone their skills at a state-of-the-art weapons and tactics centre in a former underground reservoir. The post 9/11 milieu put forth the question of whether torture (officially referred to as enhanced interrogation techniques) had any place in a civilized society that was trying to prevent catastrophic terrorist attacks. Nuances and legal loopholes were used to skirt around the “ugly things” that many believed the CIA and other intelligence agencies had to do at that time. With transfers of terror suspects to GITMO or countries like Afghanistan, Poland, Egypt, Iraq, Thailand, etc. with lower human right standards, people were being black bagged, water boarded, electrocuted and put through worse in the name of fighting the war on terror. But questions quickly emerged on whether the information extracted from torture or enhanced interrogation techniques helped in any tangible ways. And the disclosure of waterboarding and other forms of torment lead to a loud outcry in America and around the world. The United States Senate took up investigations into that matter and the Select Committee on Intelligence has now released a voluminous official report on this matter. The report is more than 6,000 pages long, but the committee voted in April to declassify only its 524-page executive summary and a rebuttal by Republican members of the committee. The investigation was conducted by the committee’s Democratic majority and their staffs. 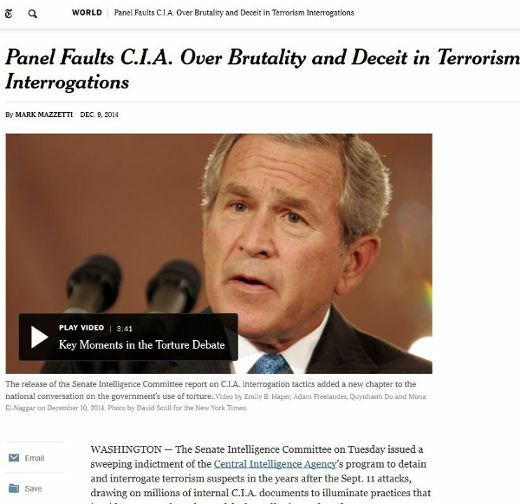 Many of the C.I.A.’s most extreme interrogation methods, including waterboarding, were authorized by Justice Department lawyers during the Bush administration. But the report also found evidence that a number of detainees had been subjected to other, unapproved methods while in C.I.A. custody. Have we been duped by terrorists? 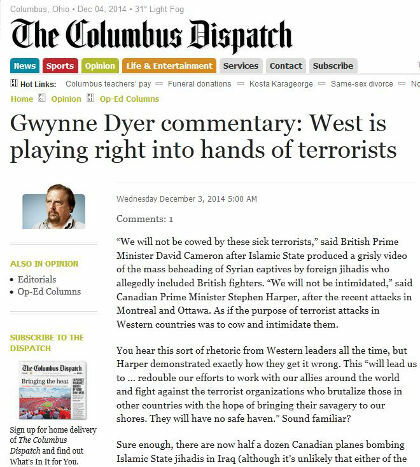 Journalist and commentator Gwynne Dyer puts forth a view that we have been duped into a “War on Terrorism” that will lead to bad outcomes for the world. His thesis revolves around the belief that the fundamentalist Islamists really want to take over the Muslim countries and to create a groundswell of local support, they needed a whipping horse. The West has provided this by invading and bombing Muslim countries, thus creating more and more freedom fighters/martyrs/terrorists. Some may consider this an overly simplistic view but it if for nothing else, it does tie in the complex subject of fundamentalist terrorism into an easy to digest morsel. Geo-politics, religion, access to natural resources, etc. would round out the analysis. The purpose of major terrorist activities directed at the West, from the 9/11 attacks to Islamic State videos, is not to “cow” or “intimidate” Western countries. It is to get those countries to bomb Muslim countries or, better yet, invade them. The terrorists want to come to power in Muslim countries, not in Canada or Britain or the U.S. And the best way to establish your revolutionary credentials and recruit local supporters is to get the West to attack you…. …The invasions, the drone strikes in Pakistan, Yemen and Africa, the whole lumbering apparatus of the “global war on terrorism” have not killed the terrorist beast. They have fed it, and the beast has grown very large: 3,361 people were killed by terrorism in 2000; 17,958 were killed by it last year. Let’s wage a war on <fill in the blank>. What could possibly go wrong? The War on Terror has been waged, at least in the United States and several other Western nations, since the start of the 21st century. Researchers and reporters continue to unearth sad stories of innocent people that keep getting caught in the many dragnets with ruinous effects on their lives. 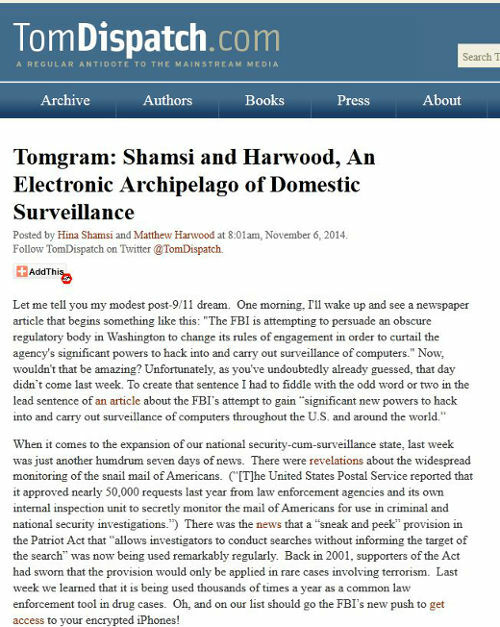 Suspicious Activity Reports, No Fly Lists, cancelled passports/travel restrictions, National Security Letters, warrants, detentions, surveillance, etc. can and are happening to innocent people. The evolving threat matrix from unconventional and terrorist actors has been a concern to many governments and their security apparatus. Even as the Al-Qaeda threat has been diminished with the sustained decade plus long War on Terrorism (WoT), the rise of the Islamic State (ISIS/ISIL), the spread of Islamic radicalization in new parts of Africa and Asia, and continued radicalization in non-Muslim countries now presents an additional challenge. 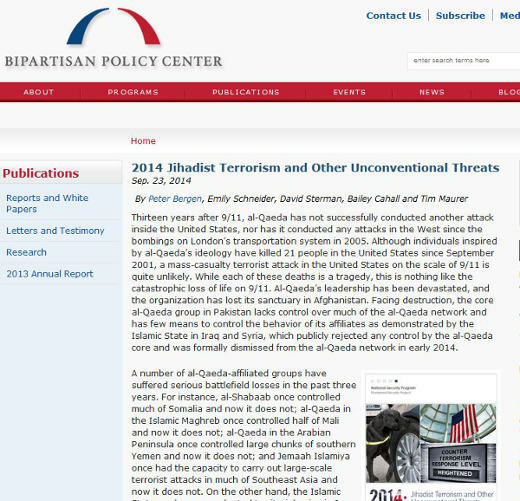 The Bipartisan Policy Center in Washington DC published a report by Peter Bergen, Emily Schneider, David Sterman, Bailey Cahall and Tim Maurer to outline these jihadi terrorism and other unconventional threats. Not surprisingly, the Bipartisan Policy Center goes by the view that the (West’s) struggle against terrorism is far from over and has in fact has entered a new and dangerous phase. “While the core al-Qaeda group that struck the United States on 9/11 has been decimated in recent years, its affiliates and associated groups have diffused throughout the greater Middle East. They now have a presence in 16 countries, more countries than they did half a decade ago. Al-Shabaab’s 2013 attack on the Westgate mall in Nairobi, Kenya, and the 2012 attack by local militants on the U.S. consulate in Benghazi, Libya, demonstrate that even relatively weak terrorist organizations can pull off deadly attacks against local targets.